Nothing is as much a confidence killer for a new parent than a baby who just won’t stop crying. You might frequently be in a similar scenario: you hold your baby or nurse him until he falls asleep and you carefully put him down only to have him crying within 10 seconds of touching the bed. In fact, it might seem to you that nothing can console your baby except a cuddle from you. But worry not. No matter what it looks like to you at this time, a baby crying for cuddles is very normal. If you were tiny and defenseless yourself, would you want to be put down and left alone to sleep? Probably not. So if nothing consoles your baby except carrying him, well, why don’t you carry him? Why you should own a soft baby carrier? Babies cry less because they get more cuddles from mom, dad, or their grandparents. You can let anyone you trust wear your baby. If your baby is underweight, you’ll be happy to know that babies who are worn in a carrier gain weight faster. This is because you can be more responsive to his needs and he has more immediate access to breast milk. Babies who are worn in a carrier are smarter because they are constantly at your eye level and so they see everything that you do. They also get to have an insider view of your interactions with other people. For this reason, they learn cues from others’ facial expressions and tone of voice which gives them some knowledge of social interaction. Babies who are worn in a carrier are more willing to be put down in bed at the end of the day. It sounds counter-intuitive, but babies will also seek space. If they no longer need to fight for your attention because they are constantly with you, they will mind less when it is time to lie in bed for the night. Being able to carry baby hands free. This means more than having the freedom to do things while carrying your baby with you. Carrying your baby in a carrier transfers and equally distributes his weight to your back and shoulder muscles making it easier on your arm muscles. Baby carriers are definitely more portable than bulky strollers. If you’re going for a walk in a crowded place or going on an errand where you couldn’t take your stroller, a baby carrier is the answer. If you pick a good quality baby carrier with an ergonomic design, carrying your baby in the carrier will be friendlier to the development of his back because it keeps it in a natural ‘C-position.’ Unlike carrying him your arms where an awkward position may twist his back to an ‘S’ shape. What features should you consider in buying a soft baby carrier? As you can see, owning a soft baby carrier has a lot of advantages. Not bad for a piece of fabric designed to help you carry your baby like a kangaroo, right? If you have not yet received one as a gift during your baby shower, you will want to go out shopping for one. And we have prepared a guide to help you make your purchase. Soft baby carriers come in different varieties to fit different babies while others are adjustable to fit babies from birth to when they are about 30 pounds. Some carriers designed for bigger babies come with a newborn insert so that you could use it from the start. You will want to think of when you want to start using a carrier and for how long so that you can make the best decision in terms of design. Aside from the weight limit, soft baby carriers come in different sizes to fit the wearer. That’s you. So when you see the size on the box, turn it to one of the side panels and you might find the size guide. On it you will find your dress size or your height. Pick the one that corresponds to your size and never go a size bigger. Soft baby carriers need to fit baby snugly to be safe and comfortable for both of you. If you find that you are in between two sizes, it’s always safer to go with the smaller size because the fabric may stretch over time. There are many choices these days when it comes to material. When you pick a material, you have to remember that you and your baby will be snuggled tightly together and share body heat. This means that you should pick a material that is light and breathable so that you and baby can stay cool. You also want to pick material that isn’t too stretchy because it could sag as baby gets heavier and it will be uncomfortable for both you and baby to wear. Instead, pick a soft structured baby carrier with material that can keep its structural integrity for a long time. Your baby may or may not spend a lot of time in his carrier. But during the times that he does, you want to make sure that you support his back and keep it in a natural C-shaped position. This means that your carrier should allow your baby’s legs to stay up in froggy position where his knees are placed higher than his hips. This usually means that the fabric of your carrier should support his weight from knee to knee and will allow him to have a deep seat in it. Carrying your baby even in a carrier could cause a lot of neck strain if the weight of your baby is concentrated on your shoulders. The key is to find a carrier that crosses your back at the waist to give you some lumbar support. This gets your strong back muscles to help lift your baby’s weight in a safe way. As your baby grows up, he may want to be carried in different ways. So when you buy a carrier, you don’t want to pick a one trick pony. Pick one that offers flexibility as to carrying positions so that you can shift to another when you and your baby are tired of your current hold. For instance, as they get older, most babies like to move to a hip carry so that they could see more of their surroundings as opposed to being carried in front of your body. If you choose a soft structured carrier instead of a wrap-style carrier, inspect the clasps and straps. You want to make sure those clasps are secure and remain locked, for obvious reasons. Likewise, you want to look at the straps and try adjusting them. They should adjust easily when you pull at them but remain in place when it is carrying your baby’s weight. This is where baby carriers become really fun. When they were first launched, carriers just came in basic colors like black, red, blue, and pink. But today, there are a lot of colors and patterns to choose from. You could pick one with a design that is as unique as you or pick one that you think matches your child’s personality. Whichever you choose, pick one that you will enjoy wearing because you and your baby may use it for up to two or three years. If you’re using your new carrier for the first time, take the time to learn how to work all the straps and adjustments. Try using a doll until you are very familiar with your carrier. Only then do you attempt to put your baby in it. This is to ensure that you are carrying your baby securely and that you will be confident when you wear your child. Leg position is very important when your baby is in his carrier. In order to avoid hip dysplasia, make sure that your baby’s legs are higher than his hips and his legs are spread wide instead of just dangling from his crotch. This means that if you select a wrap-style carrier you have to make sure that you stretch the fabric from knee to knee and that you create deep enough pocket so that his hips are lower than his knees. Learn different positions for carrying your baby. In the beginning, you will feel most comfortable carrying your baby in front of your body with his face against your chest. But as your baby grows in curiosity, he will want to be carried facing outwards or even to be worn in a hip carry. On some occasions, and with a much older baby, you will also want to learn to carry him backpack style when you need to do something that you don’t want your baby to reach. Baby wearing is a great way to breastfeed discretely and on the go. If you’re exclusively breastfeeding, you might like to practice lowering your baby to your breast while he in his carrier. Do it carefully, though, and take your time. Practice when your baby isn’t too hungry so he will allow you more time to adjust your carrier and latch. If you pick a wrap type carrier, avoid the cradle carry. The cradle carry used to be popular but is now discouraged by pediatricians because it causes the chin to touch the chest and increases the chances of asphyxiation. For the most comfortable carrying position, wear your baby high enough so that his head is close enough to kiss. This is also the most secure position for babies. Don’t be afraid to tighten your carrier because a snug baby is a secure baby. But pay attention to his air passages. You want to make sure that they are never blocked. Have more than one carrier. As with all babies, yours might accidentally spit up or you might get some breastmilk on your carrier and it will need to be washed. An extra carrier ensures that your adventures with baby won’t stop even while one is in the laundry. Holding your baby close is one of the most wonderful things you can do for him. It allows him to hear your heartbeat and your voice – the two things that comfort him the most. For you, baby wearing will also satisfy your need to nurture and share things with your child. And on your next kangaroo cuddle, we know that you will fall in love with the Tula Ergonomic Baby Carrier. The Tula is wonderfully designed and supports your baby’s developing body in all the right ways while being very comfortable to wear. With straps on both shoulders and a waist strap for lumbar support, your baby will almost be weightless so you can walk and do your errands with ease. And it helps that the designs are so beautiful. For these reasons and more, the Tula is our number one favorite soft baby carrier and you learn more about it here. 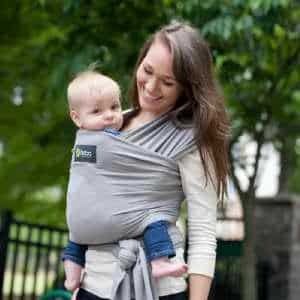 But, if for any reason it isn’t to your liking, we have looked at so many carriers to come up with our reviews of the Top 5 Best Soft Baby Carriers. We are sure that one of them will help make your bonding time with your baby extra special.